COSTA MESA, Calif. — March 28, 2019 — BenQ, an internationally renowned provider of visual display solutions, has enhanced its Premium RP Series of interactive flat panels (IFPs) with voice control powered by AWS. Directly integrating AWS with BenQ’s Saffi voice-assistant technology, the RP Series IFPs use a voice-enabled remote that simplifies instruction tasks and introduces more flexibility in the classroom. The voice capability is available as an Amazon skill and can conveniently access the deep features of the Premium RP Series through simple voice commands. 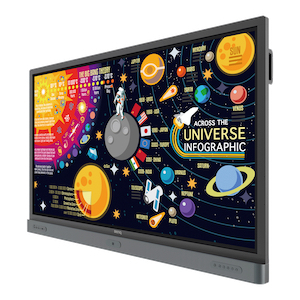 Perfectly suited for active learning classrooms, the voice-activated 4K UHD IFP lineup includes the 65″ RP6501K, 75″ RP7501K and 86″ RP8601K. A quick firmware update is available to integrate Saffi to units already out in the market. With the trusted reliability of AWS built into BenQ’s Saffi remote, the Premium RP Series IFPs further the interactive experience and collaborative technologies that were honored with a 2019 TCEA Best of Show award. Once the Saffi skill is enabled, staff can simply access the flat panel’s extensive menus via voice for easy operation. In addition, they can play specific content on the screen, change modes and more without having to be next to the panel — saving time and making operation smooth, seamless and fun. There’s only so much time available to help students be successful and meet standards, which shouldn’t be wasted wrestling with complex technology. In addition to voice control, the new BenQ Remote offers additional tools to help teachers keep the classroom on task. These tools include a pointer that creates a virtual spotlight that highlights areas on the screen and brings students’ focus to key content. In addition, the remote features a freeze screen function, enabling instructors to check and ensure the safety and legitimacy of content on their laptop before sending it to the screen for students to view. Utilizing the latest cloud collaboration capabilities, the premium IFPs offer best-in-class tools for safe interactivity. When combined with BenQ’s EZWrite 5.0 platform, the IFPs become a hub for sharing ideas, notes and opinions. Participants can capture images of the screen and make annotations on the screen from their devices, regardless of their location. In addition, files can be downloaded and uploaded to cloud services, such as Google Drive and Dropbox, directly from the screen without the hassle of connecting USB cables and other devices. The number-one-selling global projector brand powered by TI DLP technology, according to Futuresource, the BenQ digital lifestyle brand stands for “Bringing Enjoyment and Quality to Life,” fusing ease of use with productivity and aesthetics with purpose-built engineering. BenQ is a world-leading human technology and professional solutions provider serving the enterprise, education and entertainment markets. To realize this vision, the company focuses on the aspects that matter most to users, redefining traditional technology with innovative capabilities that increase efficiency, enhance learning and amplify entertainment — all while ensuring a healthy, safe and intuitive user experience. BenQ’s broad portfolio of professional installation solutions include digital, laser and interactive projectors; premium flat panels; and interactive large-format displays that take visual enjoyment to new heights in corporate offices, classrooms and lecture halls, and home theaters. The company’s products are available across North America through leading value-added distributors, resellers and retailers. Because it matters. More information is available at www.BenQ.com.